The word myofascial means muscle tissue (myo) and the connective tissue in and around it (fascia). When stressed or injured, muscles form trigger points – like bunched-up knots (see illustration) – that cause pain and tightness. Fascia can also form trigger points, in addition to becoming congealed — stiff and stuck — from lack of warmth of motion. You may find a particularly painful “knot” or a tight band in a muscle. This is likely the location of a trigger point. 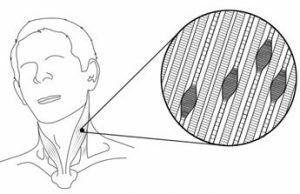 A skilled practitioner who has been trained to recognize the symptoms of myofascial pain and palpate muscles for myofascial trigger points can assess whether myofascial trigger points are present. There are no commonly available lab tests or imaging studies that can confirm the diagnosis at this time. Myofascial trigger points can be seen on special MRI scans and special ultrasound but these are currently only used in research. A diagnosis of Myofascial Pain Syndrome or Chronic Myofascial Pain means that myofascial trigger points are the primary source of your symptoms. Sometimes trigger points are present secondarily to other sources of pain, such as arthritis or bulging discs. Sometimes myofascial trigger point pain in these areas is misdiagnosed — quite reasonably — as conditions that require more aggressive treatment. These trigger points may be fully or partially causing the painful symptoms attributed to these conditions. As such, they are often called “the great mimickers”. It is important to ascertain if all or even some of your pain is myofascial when determining the appropriate treatment. Copyright © 2018 Michele Macomber. All Rights Reserved.